Since ancient times, flowers and garlands have played a significant role in the Hindu tradition. 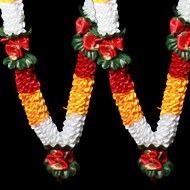 Garlands have always been utilised and believed to be the symbol of beauty, respect, love, devotion, purity and peace. Not only do flowers and flower garlands play an integral part of the Hindu customs but in diverse cultures across the world too garlands hold immense significance. 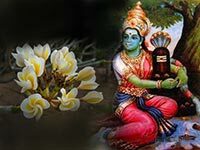 Natural fresh flowers and their fragrances serve as a medium to connect and appease the deities. Moreover, the fragrance of natural fresh flowers creates a devotional atmosphere. Flowers have the power to attract the divine vibrations and positivity of the deities. Flowers spread positive vibrations and thus fill the ambiance with positivity, serenity while inducing devotion. As mentioned earlier, flowers play a significant role in Hinduism. 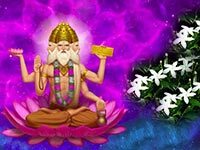 The act of propitiating is incomplete without offering the favourite flower to the respective deity. 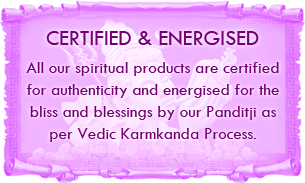 The reason of offering specific flowers to specific deity is because every flower has a distinct colour and fragrance. Also, the frequency and vibration capacity of each flower is unique and this frequency has the capacity to attract the principles of specific deity. 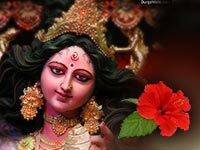 Thus, in order to be graced by the blessings of the deity and to attract positivity and overall wellbeing, it is important to offer specific flowers only to specific deities. Generally flowers with mild fragrance are offered to the deities and flowers having strong scent are avoided. Generally fully blossomed flowers are offered to the Gods and Goddesses. Let us know take a look at which flower is offered to which deity. According to the Vamana Purana, when Lord Shiva consumed the poisonous 'Halahala' which came out during Samudra Manthan, Dhatura appeared from the chest of Lord Shiva. 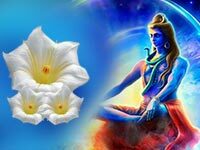 It is believed that since then, Dhatura flower is offered to Lord Shiva. Offering the Dhatura flower is said to remove the negative vices of hatred, rivalry, ego and envy. While there are some other Shiva flowers like Akand, Bael patra, ketaki flower is never used in the worship of Shiva. Lord Ganesha loves the Red Hibiscus and any red flower. 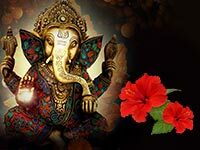 The Hibiscus flower has the capacity to attract the principles of Lord Ganesh as it symbolises strength and power of subconscious. The Ganesh principles present in the universe are attracted to the central part of the red coloured Hibiscus flower and are released in circular form through the petals. 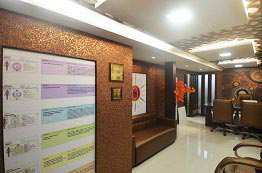 It is also advisable to use 21 different types of flowers while worshipping Lord Ganesh. Red Hibiscus and other red flowers are said to be offered to Goddess Durga. 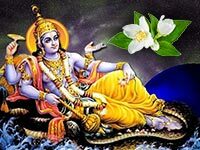 The Jasmine flower which is believed to be divine is often offered to Lord Vishnu. 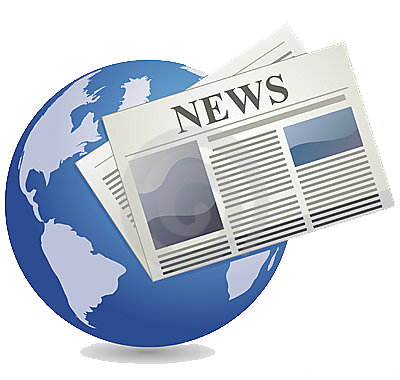 According to the Hindu mythology, the Jasmine tree emerged during the churning of the ocean. Lord Indra took this tree to heaven and the fragrance of its flowers filled the heaven and pleased all the Gods. During the churning of the Ocean of Milk, Goddess Lakshmi was the first Ratna that emerged from that ocean. She emerged in a seated position on a pink lotus. 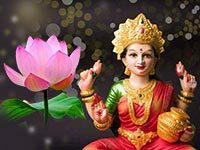 Lotus is her favourite flower hence Goddess Lakshmi is offered Lotus. Tulsi is an auspicious plant which is worshipped in Hinduism. The leaves of this divine plant are offered to Lord Krishna. In every Puja Tulsi leaves are used and Tulsi leaves are also offered as Prasada. 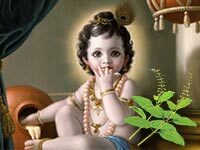 Lord Krishna loves Tulsi or the Basil leaves and hence the Tulsi is also known as Krishna Tulsi. Goddess Saraswati is always depicted as wearing a white saree, sitting on a white Lotus. 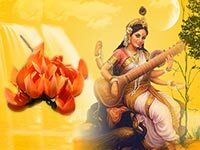 The Goddess of knowledge, Goddess Saraswati is fond of Palash flowers. Though white coloured flowers too are liked by Devi Saraswati, but the Palash flower is one of the most essential flowers that is used in Saraswati puja. 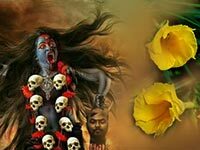 The Yellow Kaner is the most loved flower of Goddess Mahakali. 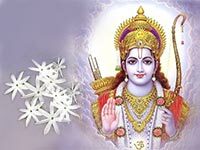 Lord Rama is often offered Chameli flower. 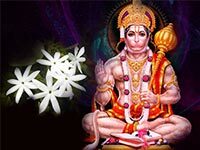 Lord Hanuman is offered the Chameli flowers and a garland made of Tulsi leaves. As mentioned in ancient scriptures, the flowers are also categorized into Sattva, Rajas and Tamas. 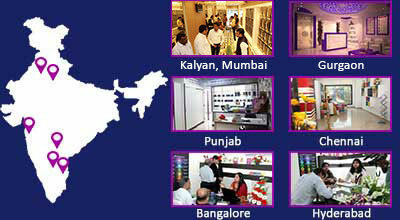 Basically, they are distinguished on the basis of their fragrance, shape, color and origin. Sattva and Rajas flowers are for the daily offerings while Tamas flowers are meant for special festivals only.While worshipping God what matters is Bhav (emotions). If you offer or put adorn the idol of God with the garland made of Satin, God accepts it as for the Supreme what matters is the Bhav of the devotee. While performing any Hindu puja if any of the ingredients is missing, the ‘Akshata’ (unbroken rice grain) can be used as a substitute. 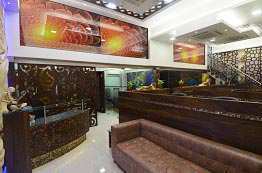 Similarly if you cannot get fresh flowers or fresh flower garlands you can use the deity garlands which are strung in satin and beads and other decorative items. 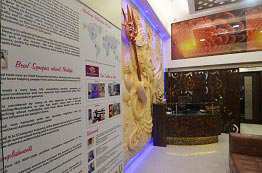 Since ancient times people adorn the idol of deities with flowers and garlands. 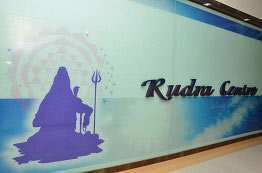 Today along with the fresh flower garlands, there is also huge demand for the artificial garlands which are made using satin ribbons, Rudraksha beads, artificial flowers, beads, and other decorative articles. 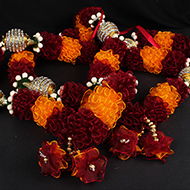 These garlands are attractive and come in various sizes, colours and materials. The artificial garlands make perfect decoration artefacts and are used to adorn the deities and to decorate the puja altars. 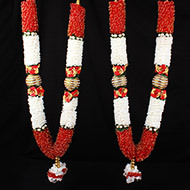 These deity garlands are durable, easy to clean and maintain. The artificial garlands enhance the aesthetic value of the altar and are also pleasing to the eyes. The Garlands under this category are beautifully and traditionally designed by stringing flowers and leaves made of Satin fabric along with different types of beads and other decorative materials. 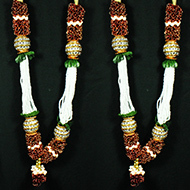 These garlands are available in different colours and designs. 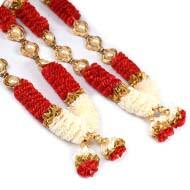 One of the most auspicious and highly popular garlands is the Everlasting Deity Garland. This garland is made from the Straw flowers also known as the Everlasting flowers. The Everlasting Deity Garland is a dried natural flower garland which when soaked in water for 5 minutes becomes natural and fresh again. 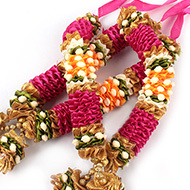 The garlands under this category are strung in auspicious 5 mukhi Rudraksha and fillers making the garlands look more attractive and enhancing the aesthetic value of the puja altar. 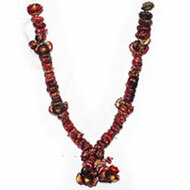 There are various options you can pick and choose from under the decorative beads garland category. 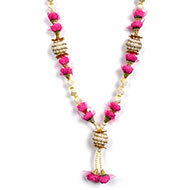 Various coloured beads and other decorative pieces are string together to form beautiful garlands. Thus, God is very loving, the divine understands and loving accepts the offerings that are offered by the devotees with a true heart.